Members of Louisiana Tech University’s Visual Integration of Science Through Art (VISTA) program traveled to Cyprus as part of an international research team collaborating on visual literacy projects. Visual literacy involves using images and different factors of design to help communicate information more effectively. The Visual Literacy (ViLi) Project is a collaboration comprised of faculty from universities in the UK, Cyprus, Greece, and Austria. Faculty from Louisiana Tech recently started working with this international team to explore areas of collaboration that could benefit students and educators seeking to share information in the modern global context. Initially, Tech Professor Dr. Kirk St. Amant, who holds the Eunice C. Williamson Endowed Chair, was invited to participate in the collaboration. He then invited VISTA faculty and students working in the area of pre-medical illustration to collaborate with the ViLi team on projects. The local team’s first work with ViLi helped explain aspects of visual literacy and communication. VISTA’s Nicholas Bustamante and Dr. Jamie Newman traveled to Cyprus to participate in the ViLi team’s semi-annual project meeting and to share the work Louisiana Tech students produced for a specific ViLi project: an open-access online course. Bustamante and Newman also presented other VISTA program successes and highlighted additional opportunities for Louisiana Tech and the ViLi team to collaborate. “This international collaboration featuring student work is an incredible opportunity for Louisiana Tech and one we look forward to continuing in the future,” Newman said. The recent Louisiana Tech-ViLi collaboration involved an online course developed by ViLi. The course was designed to provide professionals working in higher education with an understanding of how to better integrate visuals in the classroom and instructional materials. As an open-access course, its content is freely available to anyone interested in understanding how visual aids can be used to improve learning outcomes. The goal of the ViLi project – and the course – is to have 5,000 users, and the launch of an updated version of the course is scheduled for October 2018. This project fits within the goals of the VISTA program, which provides students with unique opportunities to use art to communicate scientific information to different audiences. “The ViLi course represents a great opportunity to expose students to international collaborations and the impact the universality of images and visual aids in education,” Bustamante said. 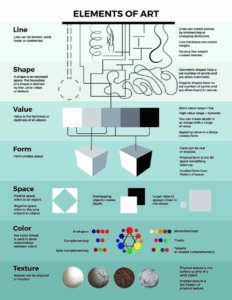 For the ViLi project, students created infographics to teach fundamental design concepts. The infographics were designed to teach others, including educators, how to create their own visual images. VISTA students Cinthia Rincon, Sarah Ilgenfritz, and Jade Noble collaborated with the ViLi partners to create a series of images for the online ViLi course so that participants can overcome language barriers and have greater access to content. The success of this initial set of images has generated additional opportunities for students to continue contributing to the course. Specifically, the digital painting class and work of pre-medical illustration students will serve as a case study for the on-line course. In addition, the VISTA program will work with the ViLi project to measure the impact that different images have on different audiences in order to generate models for using visuals to communicate scientific and medical information effectively. ViLi is sponsored by an Erasmus+ grant from the European Union. Local support from the University, the Eunice C. Williamson Endowment Fund, Tech’s Technical Communication Program, the College of Liberal Arts, and the School of Biological Sciences made the Cyprus trip possible.